Jan Ake Jonsson has led Saab since March 2005. He joined the company in 1973. 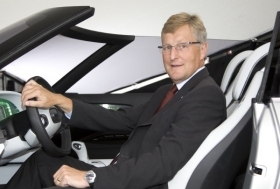 MUNICH -- Saab Managing Director Jan Ake Jonsson and the carmaker's entire board will be replaced immediately as parent General Motors Co. continues with the wind-down of the Swedish automaker. Despite the management change, GM continues to assess bids for the money-losing brand, the U.S. automaker said in a statement Tuesday. Stephen Taylor and Peter Torngren of restructuring firm AlixPartners have been appointed as Saab's wind-down supervisors. Last Friday, GM named AlixPartners to run Saab's liquidation, which is expected to take several months. Jonsson will remain with the company and assist the supervisors, a GM spokesman said, however it currently is unclear what role the longtime Saab executive will play in the process. Jonsson was named managing director of the company in March 2005. He has been with Saab since 1973. GM is taking the required steps to close Saab as it puts pressure on bidders to sweeten their offers for the 60-year-old automaker. GM executives said on Monday none of the bids received so far had met the financial requirement for a deal and signaled they were moving ahead with plans to wind down Saab. "We're closing down Saab," GM Chairman and acting CEO Ed Whitacre told reporters on the sidelines of the Detroit auto show. GM Vice Chairman Bob Lutz said: "The offers we've received so far in terms of risk and financing up-front have been just as good as winding it down." In the same conversation Lutz said that GM remains open to offers from potential buyers, even though time is very limited. Luxembourg-based investment firm Genii Capital aims to make a better offer for Saab, a company spokesman said on Tuesday. Dutch luxury carmaker Spyker Cars NV and a group of Swedish investors also are trying to convince owner GM to sell Saab instead of shutting it down. Spyker last week said it had submitted an improved bid for Saab.